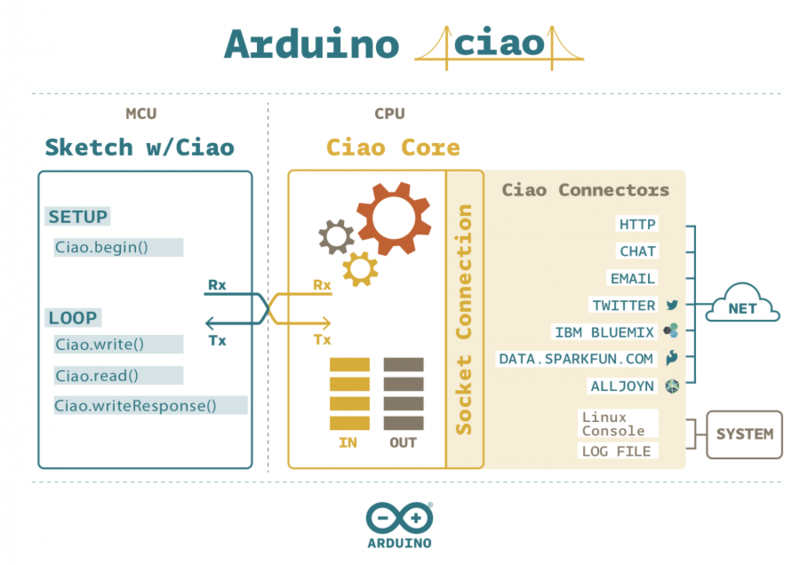 Arduino Ciao is a easy-to-use and powerful technology that enables Arduino sketches to communicate intuitively with the "outside World". It aims to simplify interaction between microcontroller and Linino OS allowing a variety of connections with most common protocols, social networks, third-party services and applications. Arduino Ciao - from now-on simply "Ciao" has been designed and developed to be modular and easily configurable. Its goal is to support several Connectors capable of interacting with system resources (filesystem, console, etc...) and to communicate with the most common and useful protocols (MQTT, XMPP, HTTP, SMTP, etc..) and applications (Jabber,Twitter, Facebook, etc.). Ciao Library is a lightweight library that can be used inside sketches for MCU to send and receive data, via serial communication, in a simple and intuitive way. To communicate with the "outside world" the Ciao Library interacts with Ciao Core: the key component of the Ciao technology on the MPU (microprocessor) side. Ciao Core runs over Linino OS, it is developed in python and it has been designed to enable communication with "outside world" via several modules called Connectors. Such connectors communicate with Ciao Core using JSON strings sent over a TCP socket. support connectors written in any programming language available on Linino OS. A Connector is a standalone module that on one hand communicates with Ciao Core to send/receive data to/from the microcontroller, and on the other connects to external services and/or applications through specific protocols. Connectors are the tools of Ciao to connect to the World. Main Connectors like RestServer, Shell, MQTT are pre-installed with Ciao, other connectors and Third party connectors are available in the Connectors Repository, and installable via opkg, see the installation section for more information. 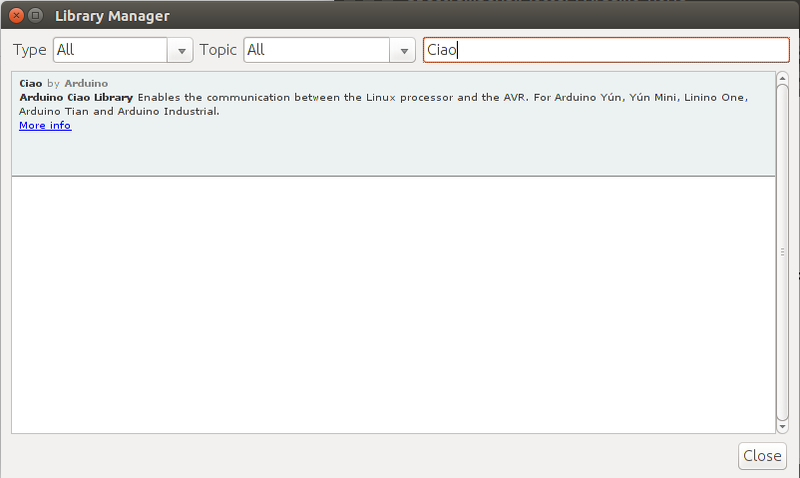 If you haven't installed the Ciao library yet, you won't get notified about its updates. Anyway, you get the library status by writing its name in the search field on top of the Library Manager.